This Goth Bride is wearing an ensemble consisting of skirt, bustier, underskirt, gauntlets, garter, tophat, flower bouquet. The skirt is made of purple silk taffeta. It is fully gathered with a modified train and fastens in back with a hook and eye closure. It is trimmed with hanging lace strips tied with a love knot. The underskirt is four layers of gathered black tulle in two different lengths and fastens with a ribbon tie. The bustier is of the purple silk taffeta covered with black lace and trimmed in in the bust area with ruffled organza and ruffled lace. It closes in the back with eyelets and a ribbon tie. The gauntlets and garter are of black lace. The garter is trimmed with a black bow. The top hat is made of purple silk taffeta, enhanced with a black tulle veil in front and bows of black tulle and purple ribbons with streamers in back. 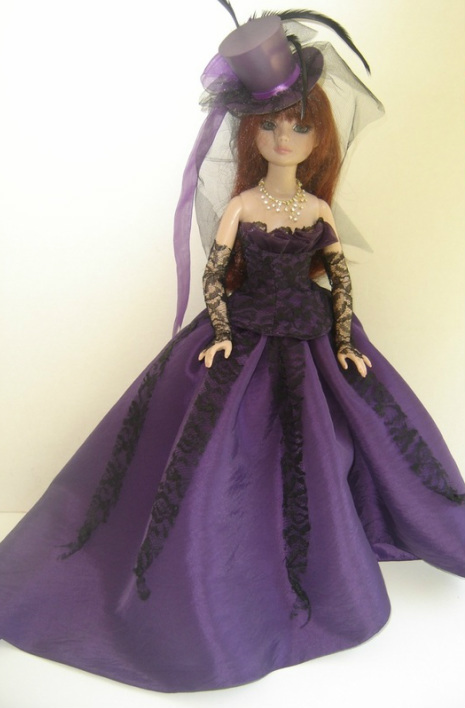 It has a purple ribbon band and is embellished with black feathers. The bouquet is made of different shades of purple flowers with black tulle, a purple bow and blck ribbon streamers. Doll, necklace, & Shoes NOT included. Insurance is required and is included with shipping.